New Version: This product is the New VGA Audio USB conversion cable, with the compact portable design, convert through standard definition VGA analog signal resource and input audio into output HDMI. Audio Conversion: Full HD1080P, HDMI Output Resolution up to 1080i/1080P/480P/ 720P@60Hz, Purely Digital HD Display, No Ghosting, No Transmission Loss, No Fuzz, RGB Color Fidelity. Advanced Material: Adopted ABS material, it ensures durability and quality. Slim Design: No power adapter required, support plug and play, no drives required. 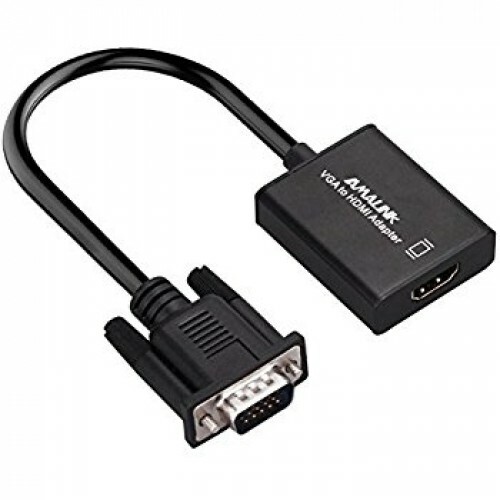 NOT Bi-directional: It only converts signal from VGA to HDMI, ideal for Computer Desktop Laptop PC Notebook DVD from analogue VGA sVGA to HDTV HD Plasma TV.